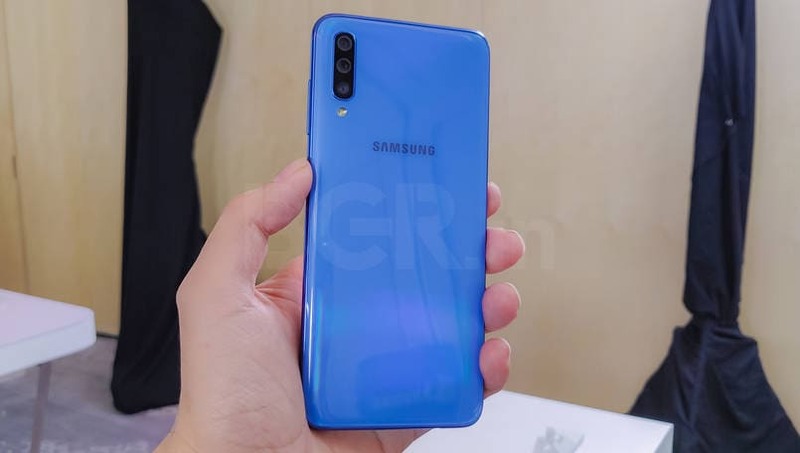 The Samsung Galaxy A70 is a more refined version of the Galaxy A50, which comes with Qualcomm Snapdragon 675 instead of Samsung's own Exynos SoC and some upgraded specifications on the camera front. Here's what I liked and disliked about the phone. It runs Android 9 Pie with One UI on top. Samsung is pushing the refreshed Galaxy-A series smartphones in the market to cater consumers in all segments. 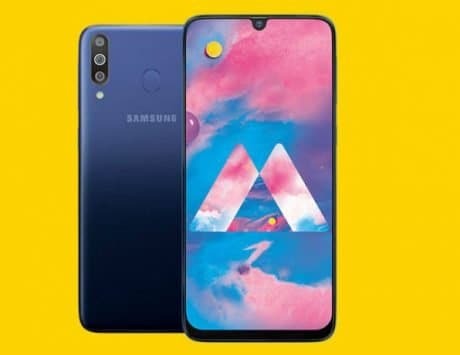 The Galaxy A70 launch is on similar lines, where the smartphone would operate above Rs 20,000 segment, just above the Galaxy A50. Samsung has only announced it globally, but there is no pricing as yet. 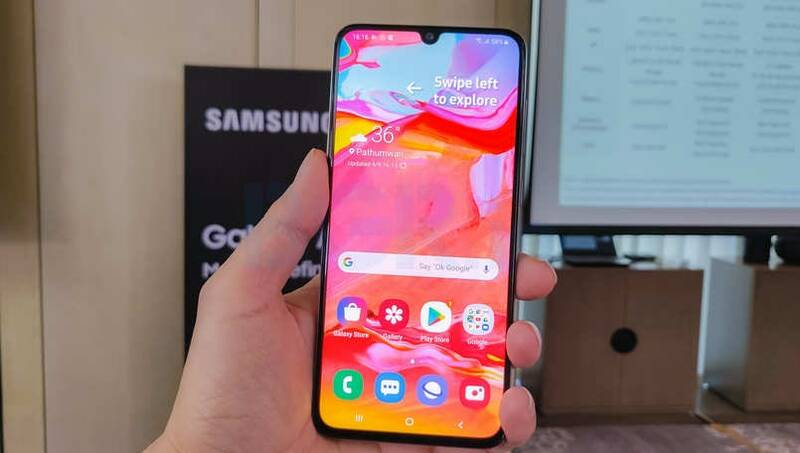 The South Korean company hosted an event simultaneously in Milan, Sao Paulo and Bangkok where it unveiled the Galaxy A70 along with more premium Galaxy A80. The smartphone is a more refined version of the Galaxy A50, which comes with Qualcomm Snapdragon 675 instead of Samsung’s own Exynos SoC and some upgraded specifications on the camera front. Rest of the features are same as A50, which include Infinity-U display (waterdrop notch), triple rear cameras and more. 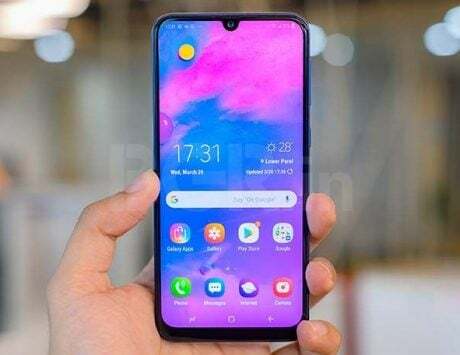 The Galaxy A70 will gradually go on sale in different markets of Asia first starting April 26. While we are expecting the phone to make it to India soon, here are my first impressions of the Galaxy A70 from Thailand launch event. 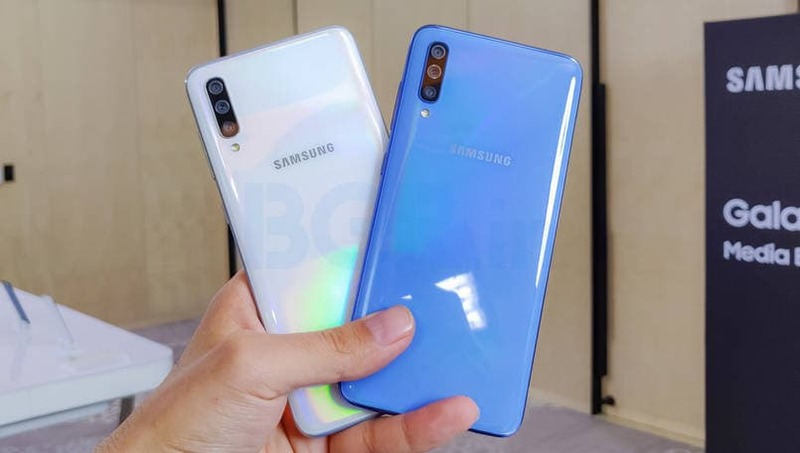 The Samsung Galaxy A70 looks similar to the Galaxy A50 in terms of design. The phone carries a slightly taller 6.7-inch full HD+ display instead of 6.4-inch. This is the same Super AMOLED Infinity-U panel as the Galaxy A50, and you’ll find an in-display fingerprint scanner, standard Face Unlock upfront. 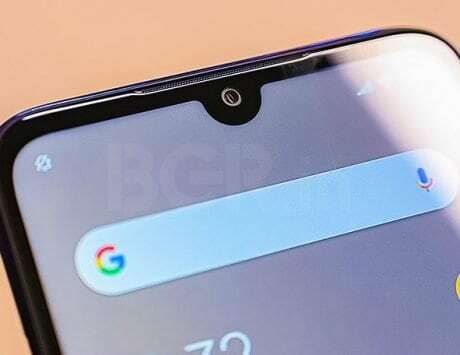 Samsung has actually reduced the bottom bezel a bit on Galaxy A70, as a result it offers 1080×2400 pixels resolution with 20:9 aspect ratio. I found the phone to be more premium than Galaxy A50. It also felt lighter in hands, although single hand operation is still difficult like all other big-screen phones these days. The back is made of polycarbonate with glass-like finish. The handset will come in four colors- Black, Blue, Coral and White. Under the hood is an octa-core Snapdragon 675 SoC in the Galaxy A70. You get two performance cores clocked at 2GHz and six efficiency cores clocked at 1.7GHz. 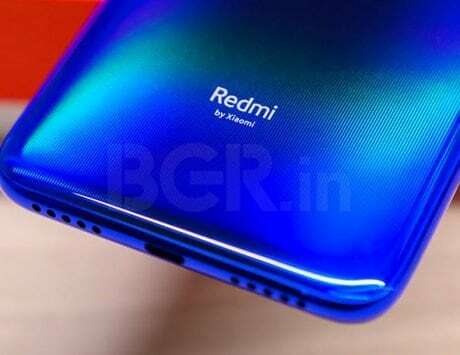 The handset will come in two variants – 6GB RAM and 128GB onboard storage, while the other variant will have 8GB RAM with same 128GB storage capacity. There is support for microSD card up to 512GB. For the power, it packs a 4,500mAh battery with support for ‘Super-Fast charging’ at 25Watts. 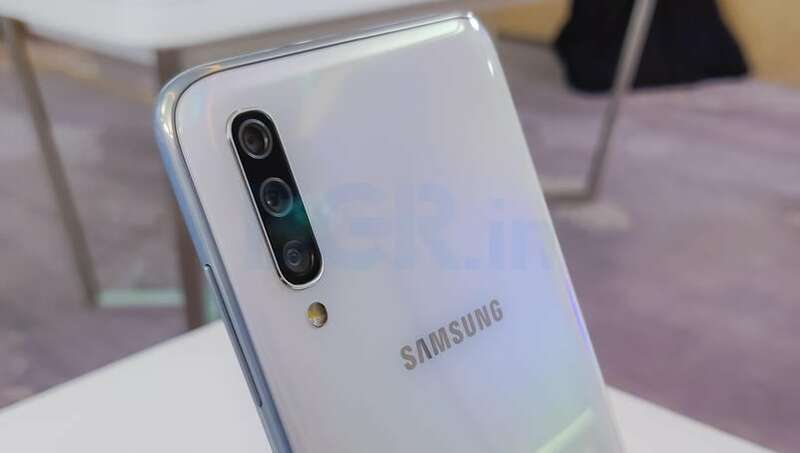 Moving on to the cameras, Samsung has bumped up 25-megapixel lens of Galaxy A50 to a 32-megapixel primary sensor on both front and back in Galaxy A70. The handset offers primary triple camera (vertically aligned) setup with 32-megapixel f/1.7 aperture, an 8-megapixel sensor with ultra-wide (123 degrees) angle lens, and a 5-megapixel depth sensor with f/2.2 aperture. For selfies, there is again a 32-megapixel front-facing camera onboard with f/2.0 aperture. In my limited time with the device, I found both cameras on Galaxy A70 to be at par with Galaxy A80. Even the back camera without the 48-megapixel was able to click great shots like the A80 in indoor lighting condition. I have also used the Galaxy A50, and from my experience, the camera on Galaxy A70 appears much superior. Having said that, it’ll only be right to pass judgment after detailed testing. So wait for our full review for the same. 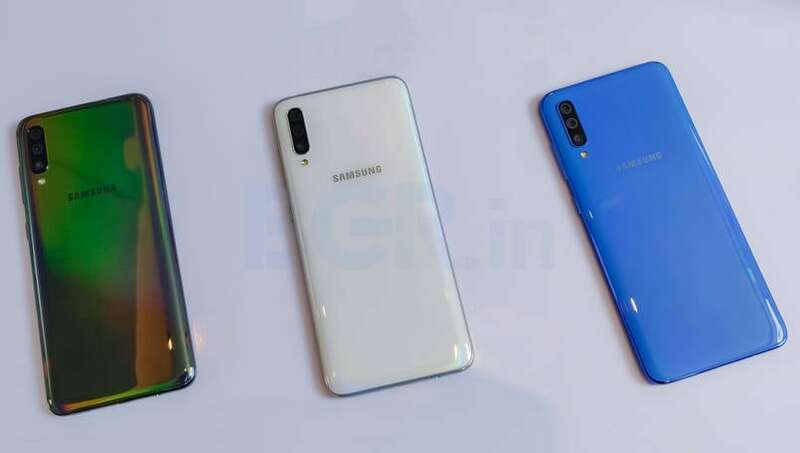 Samsung’s latest Galaxy A70 appears to be bringing a balanced hardware-software combination in a segment where the choices are very limited, especially a market like India. We are not sure of the pricing as yet, but it appears to be rivaling Vivo V15 Pro, Oppo F11 Pro and Nokia 8.1 for now. Samsung has opted for Qualcomm Snapdragon 675 in Galaxy A70, and the processor has done a great job on all other devices that it has been seen on. My first impressions of the Galaxy A70 are satisfactory. I did not find anything unlikable in the phone. The display, cameras and software experience felt a good combination overall. 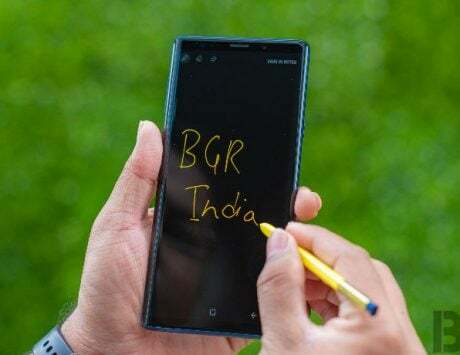 It is expected to launch in India soon, and I feel the pricing will decide the fate of this phone.